There’s a revolution underway—from inner city farmers’ markets to community supported agriculture (CSA) programs to school cafeterias serving locally grown food, people across the country and the world are rejecting industrial food and farming in favor of local, organic, community-scale systems. Now the most critical challenge is the lack of farmers with the training and knowledge to produce and market fresh, delicious organic food while caring for the land and community in which they work. The seeds of this revolution in the U.S. were planted more than 40 years ago in Santa Cruz, California. There, an innovative English horticulturist named Alan Chadwick started the Student Garden Project and the 25-acre farm that together became the UC Santa Cruz Farm & Garden and the site of a unique, hands-on training program. His apprentices helped pioneer the organic food and farming movement in California and across the country, spreading the word about how food could be grown using techniques that respected nature and conserved natural resources while yielding sustained, bountiful harvests. Over the years the organic training was formalized into a six-month fulltime apprenticeship that attracted participants from across the country and abroad. Interest in the program is now at an all-time high, with a record 152 applications received last fall for the 38 positions in the 2009 Apprenticeship. Today, more than 1,200 apprentices have been trained in the organic fields, orchards and greenhouses at UC Santa Cruz, learning not only how to raise food and flowers, but how to make the food system itself more sustainable by addressing issues of social justice. They are today’s organic farmers, market gardeners, urban agriculturalists, school garden teachers, and others working to promote local, healthy food in communities around the country. 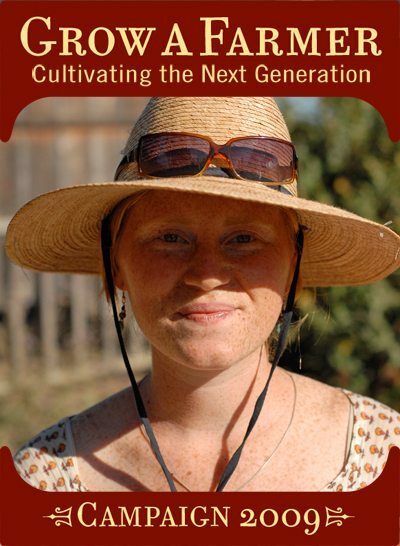 Help us grow more farmers by supporting the Apprenticeship Program! The Apprenticeship self-generates most of its operating income through produce and plant sales program tuition and fees, but we depend on donations and grants to complete our annual budget. This year we have put out an urgent request to our supporters to help us with not just operating expenses, but also for the apprentice housing project that must be completed this year. One critical element of the Apprenticeship has been the immersion learning made possible by a full-time residential program. For many years apprentices have been invited to live in tents at the UC Santa Cruz Farm during the six-month training, but 2009 is the last season in which living in tents is allowed.